"Mr. Hunt, this isn't mission difficult, it's mission impossible. 'Difficult' should be a walk in the park for you." MPAA Rating: PG-13 for intense sequences of violent action and some sensuality. Even before its May 24th debut earlier this year, Mission: Impossible II was already being crowned a summer blockbuster—and it had good reason to be. 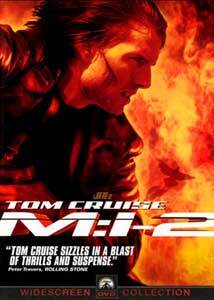 With superstar Tom Cruise returning to the role of Ethan Hunt from the 1996 M:I film, and the amazing John Woo at the helm, M:I 2 had a license to print money. For those who dubbed the original film "Mission Unfollowable," this is the movie for you. In fact, you can add M:I 2 to the short list of movie sequels that actually improve upon the first outing. At the start of the film Sean Ambrose (Scott) steals both the virus Chimera and its antidote from Biocyte Pharmaceuticals in Sydney, Australia. Like any movie villain Ambrose plans to unleash it into the world as he gets rich when the antidote is needed. To stop Ambrose, IMF director Swanbeck (Hopkins) calls on Ethan Hunt (Cruise) to recruit Ambrose's old flame, Nyah Nordoff-Hall (Newton). As if it were a Bond film, Hunt falls for Nyah, and things get complicated when saving her is as important as saving the world. Throw in Luther Stickel (Rhames) from the first film, and assorted bad guys and good guys and you have the makings of another impossible mission. It has been reported that screenwriter Robert Towne wrote the script around several key action scenes that director John Woo had devised. After seeing the film, that story is easy to believe. It seems as though it is divided into two halves: the first, a tightly made homage to Hitchcock's Notorius; the second, an all out John Woo action extravaganza. What is most impressive is Woo's handling of the action scenes. Woo incorporates his trademark visual style to many of these scenes, including pigeons, billowing clothing, slow motion action shoot-outs, and a seemingly endless supply of bullets. While none of the action sequences match the brilliance of the apartment shoot-out in Face Off, they are still expertly done. Cinematographer Jeffrey Kimball's work is top notch and his scenes at the start of the film are breathtaking. A Mission: Impossible film wouldn't be the same without Cruise, whose work here caps off an incredible 12 month span for the actor. From his amazing supporting role in Magnolia, to his top billing in Kubrick's final masterpiece Eyes Wide Shut, Cruise has chosen three very diverse roles. But unlike most actors he is able to carry of each of them with aplomb. I will be the first to admit that I think Cruise makes a great action hero, and he is more believable than ever in this film. Doing his own stunts, including the rock climbing that begins the movie, he plays Hunt with a certain swagger that is missing from most action stars. Newton, who is a newcomer to most, is terrific as Nyah, and her scenes with Cruise work very well. There is a certain amount of heat generated between the two that was sadly missing from the love story in the first film with Emmanuelle Beart. Actor Dougray Scott is a bit too much as the villain, but he plays the part so over-the-top that it works. Anthony Hopkins and Ving Rhames turn in good performances in what amounts to essentially cameo roles. The film has its problems—essentially it becomes a tough wait for the action scenes on the second or third viewing. I would sit through a movie about a guy grocery shopping if it were directed by John Woo because I know that it would have style to spare, and that is essentially what M:I 2 has. It is a movie so amazing to watch unfold that all you can do is sit back and enjoy the ride. In other words, this is a perfect summer blockbuster. "You know, the hardest part about playing you is grinning like an idiot every fifteen bloody minutes!" Image Transfer Review: The anamorphic 2.35:1 transfer provided on this disc is nothing short of reference quality. The sharpness, detail and colors are all perfectly done. The only small problem I noticed was in some of the darker scenes towards the end of the film (in the lab as well as at the hideout), the bluish tones seemed a bit grainy. It might have been my TV as I noticed no problems like this anywhere else on the disc. Neither pixelization nor shimmering is a problem. Next to Sleepy Hollow and Rules Of Engagement, this transfer is among the best I have seen from Paramount. Audio Transfer Review: From the winds in the canyons at the start of the film to the hail of bullets in Chapter 10, this Dolby Digital 5.1 mix rarely lets you down. The surround channels are constantly active with either sound effects or Hans Zimmer's booming score. The .1 LFE channel gets quite a work out in the action scenes and bass is always tight and well defined. Dialogue comes across well amidst the action and the left and right speakers blend well with the other speakers to create an encompassing mix. Strangely, only a French 2.0 Channel mix is offered, with an English 2.0 track missing. Extras Review: This is without a doubt Paramount's biggest disc to date, and they have loaded it with the amount of extras worthy of such a big blockbuster. The best extra feature is a commentary track by the director. Woo never lets the track get too focused on the technical aspects of filmmaking, and spends some time talking about his views on the story. Although his accent gets a bit thick at times it is never really a problem. This is the first track I have heard by Woo and after watching it I am tempted to pop in my laserdiscs of Hard Boiled and The Killer and hear his thoughts on those films. A fourteen minute making-of entitled Behind the Mission shows some behind-the-scenes footage, as well as interviews with the cast and crew. At only five-and-a-half minutes, Mission Incredible is a bit more interesting as it deals with the stunts done in the film. Eleven short featurettes break down some of the action scenes of the film in a section called Impossible Shots that is an interesting way to see how some of your favorite scenes were filmed. From the Biocyte shoot-out to the fight that closes the film, each of these 11 is worth a look. On the lighter side of things an alternate title sequence is shown and I can go either way when it comes to which one was used. An absolutely hilarious short that was shown on the MTV Movie Awards called Mission Improbable is, for me, the real treat of the extras. While Woo's commentary is the best extra, this short featuring Ben Stiller as Cruise's control freak of a stunt double is hilarious. Both Cruise and Woo pop up in the clip. If I have a gripe about this disc, it is the lack of two supplements that would have made it great. The first is the surprising lack of both a teaser and theatrical trailer for the film. Paramount is starting to create a trend with their lack of trailers and it is starting to get bothersome. The second is that there is a Metallica video for their song I Disappear, but there is no video for the infinitely better Take a Look Around by Limp Bizkit. Take away the words of Bizkit's song and it makes a great theme for the movie; I for one would rather hear Wes Borland's guitar in the action scenes than Zimmer's overpowering score. Although, I am concerned that by getting this disc free for review, that my having the Metallica video in my collection without paying for it might send Lars Ulrich to my door threatening to kill me! I am in the very small group of those who think that this is a good film. While I enjoyed the original, I think that the sequel takes it up a notch or two with the help of Woo's direction. You really can't go wrong with this disc when you take into account the extras and the quality of the transfers. Recommended.